One of my favorite places for a delicious meal is Ilili, a contemporary Lebanese restaurant that has a wide range of vegetarian (and vegan) options. The restaurant is no new-comer in the NYC restaurant world – I think it has been around for at least 5 years (please do not quote me, but I do remember eating there as early as 2008). Ilili is one of my favorite restaurants because of the great service, delicious food, and the wide range of vegetarian options. The dining room is large and so is the bar / lounge area. A few years ago, the host would not seat us until the entire party had arrived, and would instead direct us to the bar. I guess it’s a sign of changing times, because last week, part of our dinner party got seated before the rest arrived. If you do get seated in the lounge area, you can order from the entire dinner menu there and therefore, you are not missing out on anything. 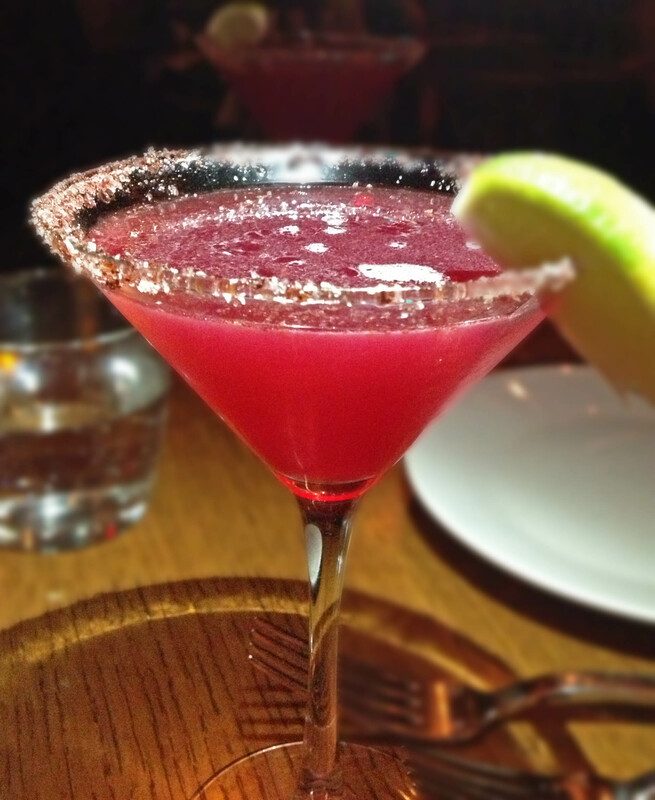 My favorite drink at Ilili is the “Poison Sumac Margarita”. The drink has tequila, orange juice, pomegranate juice (or passion fruit juice at times), and lime – an ideal combination of sweetness from the juices, tartness from the lime, and salty spice from sumac and salt on the rim. Must get this drink, if you ever go to Ilili. I find that the margarita with ice is too cold for me, so I always ask for the drink in a martini glass, just like in the picture below. My friends and I decided to share everything as always. 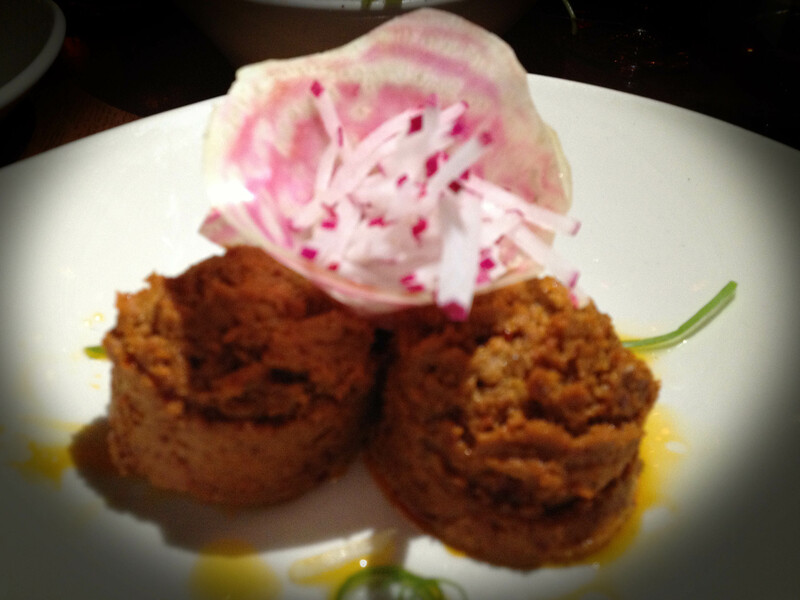 We ordered a few plates of appetizers, often the best way to enjoy a wide range of vegetarian dishes. We ordered the fattoush salad, mouhamara, labne, falafels, brussels sprouts, shishito peppers, and riz. 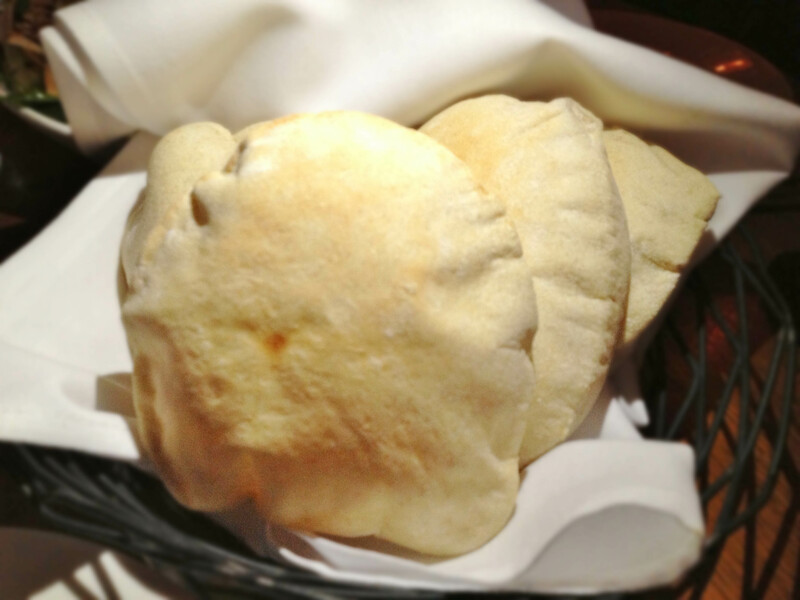 Ilili’s freshly made pita bread is excellent. It’s always warm, and completely puffed out – reminds me of a phulka, although it is much thicker. 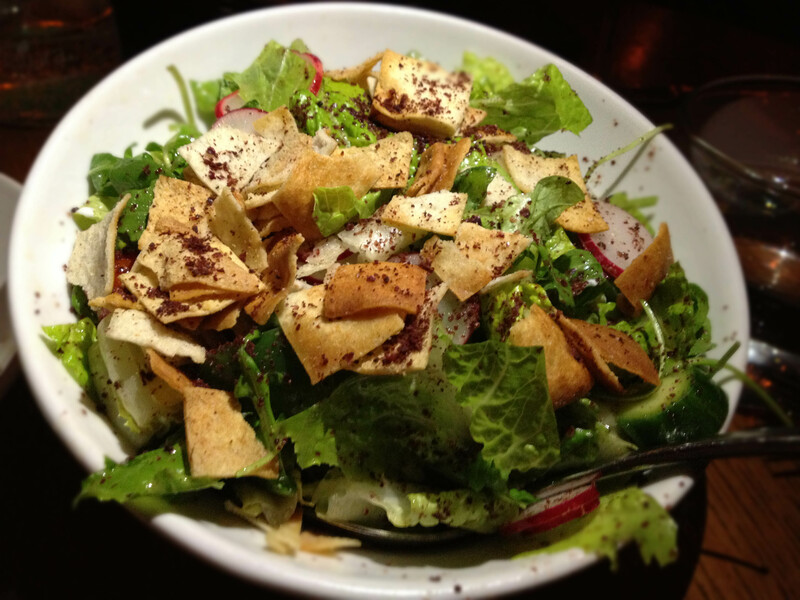 I love the fattoush salad (vegan / vegetarian) for it’s crispy squares of flat bread that are dusted with a tangy spice (sumac?). It’s a delightfully fresh salad and a perfect way to start a meal and to feel that you are eating healthy, when you are otherwise eating falafels and deep-fried brussels sprouts. Mouhamara – made of walnuts, sundried peppers, and pomegranate molasses (vegetarian / vegan) – is usually delicious according to my friends. This is not one of my favorite dishes, because I find it a tad too sweet for my taste. I did, however, love the fresh radish on it. I love the labne at Ilili. 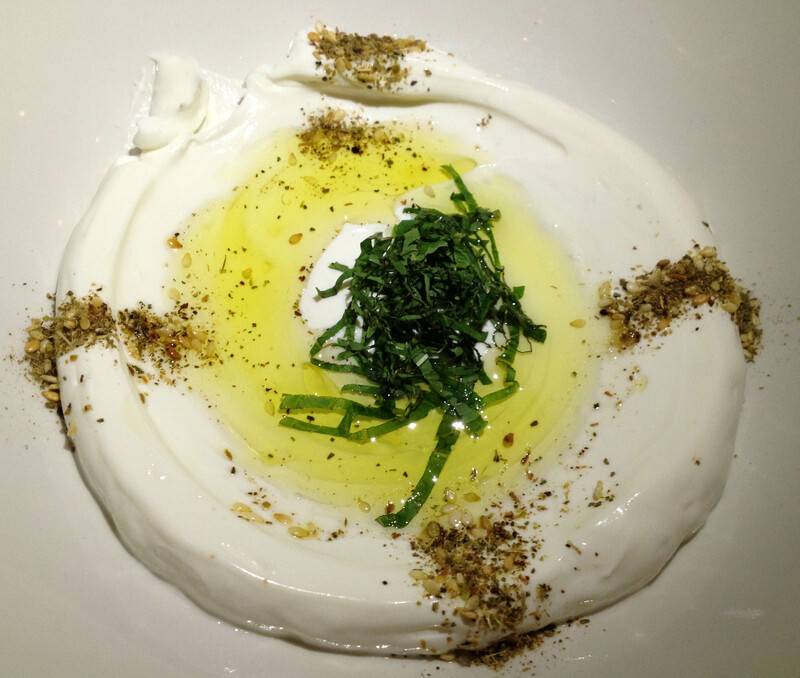 It is thick creamy strained yogurt, with some olive oil in the centre, and with zaatar, and chopped mint. The South Indian in me needs the yogurt to make any meal complete. The falafels at Ilili definitely qualify as among the best in the city. As in most other restaurants, the falafels at Ilili are served as spheres, but this time at Ilili, they were served as four small cubes. We usually crave for more falafels right after we finish the dish, so order another one, and are then struggling to finish it. These falafels have a crispy dark exterior with a soft, crumbly interior, that is salted and spiced adequately and served with tahini sauce. Now for my favorite dishes of the evening. 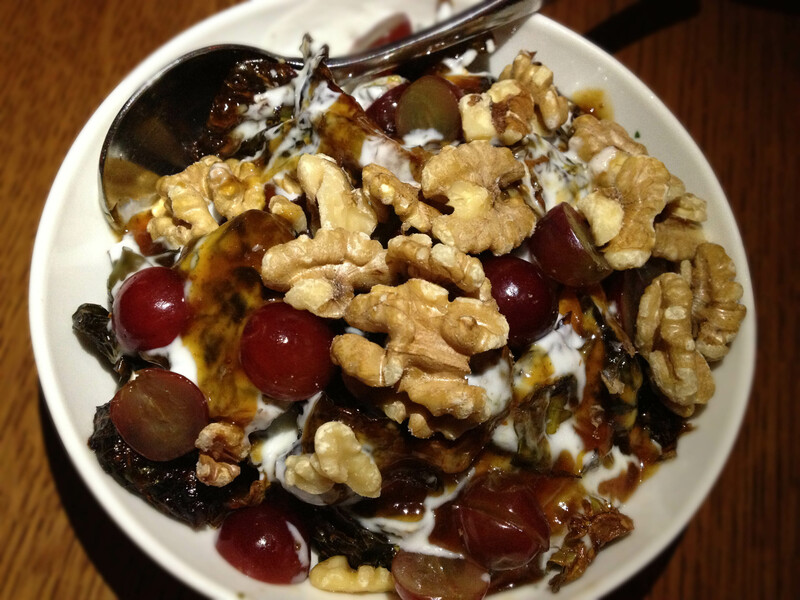 The brussels sprouts were served with walnuts, sweet red grapes, fig jam, and with mint yogurt. This is one of the vegetarian best brussels sprouts dishes in NYC. Often restaurants serve brussels sprouts with bacon but that dish is different altogether (how can I compare a vegetarian dish to a non-vegetarian one?). The deep-fried, crisp, and caramelized brussels sprouts, with walnuts, offered a different texture to the soft, yet firm sweet red grapes, and a welcome flavor to the sweet fig jam that was well-balanced with the mint yogurt. 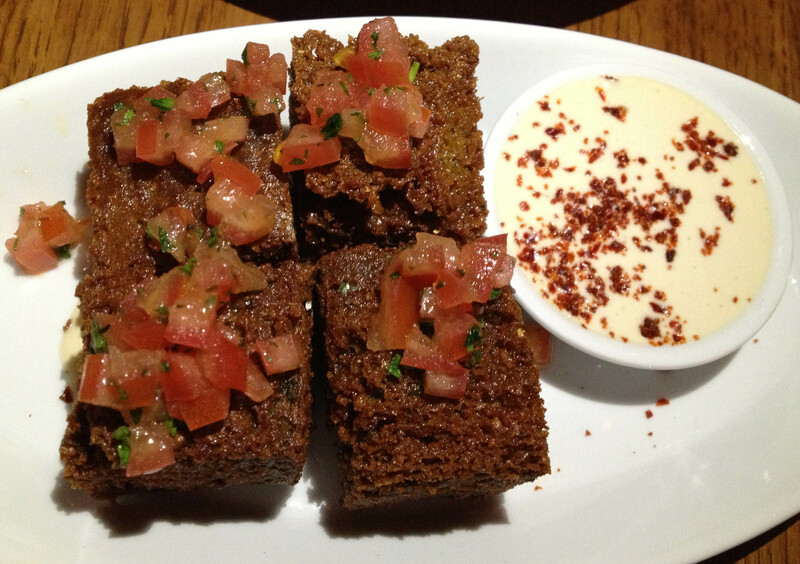 This dish is a “must-order” dish at Ilili. 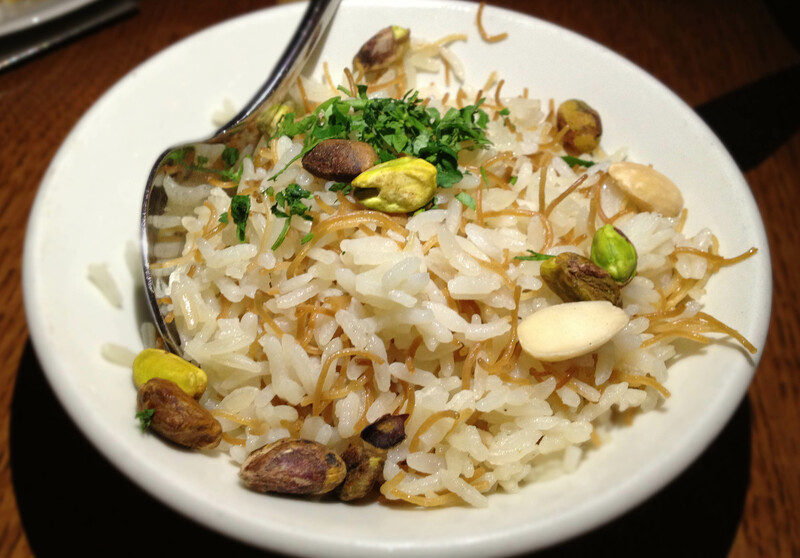 Riz is a Lebanese rice with toasted vermicelli and mixed nuts (roasted pistachios and almonds). This dish tasted like a cross between a vermicelli upma and a light fluffy pulao / pilaf. Another “must-order” dish at Ilili. Sometime during the meal, the we were told that the restaurant had run out of shishito peppers (for the shishito a la plancha served with lemon and sumac). We didn’t think we were late for dinner for the restaurant to have run out of ingredients, but we didn’t mind not getting the dish, as we were getting stuffed with the rest of the dishes that were on our table. Chicken shish taouk – skewered chicken served with a sumac garlic whip. This chicken is the closest one can get to a tandoori chicken tikka in flavor, texture, spices etc. Take a look at the Ilili menu and you will be tempted to eat there this weekend – for dinner or brunch. Why would you want to eat at Ilili?